Some folks have emailed and twittered asking how I am managing in a little trailer with my right hand in a brace, quarters 3 feet by six feet = 36 square feet of floor space and no cabinets. No one ever promised this would be easy only that it would be an adventure and believe me—a journey. One must be adaptable. One must know some cuss words. One must believe in the journey. One must be ambidextrous. All of these are at my fingertips and in my heart. Arise with the sun (that is park your trailer so the windows face mostly west). Be prepared to dance until you can get enough clothes on to cross the road to the heated restroom with clean sinks and enclosed single showers. Understand that upon your return that your puppy will be spastic having spent 30 minutes alone in these strange surroundings while you showered and took care of other business left handed. Plan your meals knowing that your little “cooler-type” electric refrigerator holds bounty beyond imagination in left overs. For example: From the food box three days ago I dug out a box of mac and cheese. Laced it with half a can of an experimental product known mostly in Hawaii called SPAM (25% fat truly its right on the can). As a back up: Bush’s baked beanz also laced with SPAM. One does need to learn WHAT GOES WELL WITH WHAT! Yesterday I went to the Piggly Wiggly down on Toogoodoo Road and bought a whole chicken. It rained like hell yesterday so me and Minna stayed inside to sort stuff out. Meanwhile we cut up the chicken—as best we could with one hand and one knee—and tossed it in the big pot with chopped onions, chopped celery and a couple of bay leaves. Open the roof vent because the home was becoming a sauna. After sufficient time we turned off the heat let the whole business cool. Later we added salt and pepper, sliced carrots, chopped zucchini, Japanese noodles and a portion of the cooked chicken including a whole wing to a smaller pot. When ready: feasted. YUM. Now we have the rest of the chicken to make another meal curried chicken on rice then another meal of chicken stew. YUM YUM Really! I suppose you get the picture. This Morning on Minna’s constitutional we also met Dave down on the beach. A likable fellow planning a cross country trip by car to visit his daughter in California and YOSEMITE too! OH BOY. Pick me, pick me! Today we also saw a thirteen foot alligator! and an eight week old squirrel. 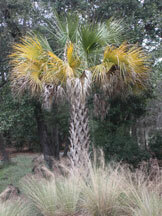 A gorgeous Palmetto and by the way, we couldn’t find the library. I stopped on the side of the road where two women were yard selling some dollar general products for $3.00 each. “LIBERRY? Ain’t no Liberry roun heeya?” There is a language barrier in some quarters. A nice young woman at the “With These Hands” Gallery set me straight and told me there was not one but two libraries but neither has a sign. I might be better off at the Edisto Beach Museum and you know: I was. Tomorrow: For Whom the Bell Tolls, Charleston. Hey Bill! I know you are really missing the snow here in Virginia Beach! Next we want the recipe blog to include spam! I know you have really good quality cuppa tea though…. Spam. Seriously. Next you need to try a SLT: Spam Lettuce & Tomato, just like a BLT. Add peanut butter (chunky) if you dare. Yummmmy!